Siesta Shores Marina is off the beaten path, yet only 30 minutes from downtown. We are especially convenient to those in Lakeway, Sweetwater, West Cyprus Hills, Westlake, Bee Caves, Oak Hill, Circle-C, Dripping Springs and Southwest Austin. 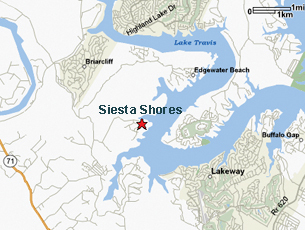 Siesta Shores MarinaÂ is conveniently located off of Hwy 71 West just west of Bee Caves, Texas. The marina is nestled in a protected cove on the second largest basin on Lake Travis. We are located at the 19th mile marker from the dam, overlooking Lakeway and Point Venture. There is less boat traffic and more wildlife in this area.Â We cater to families, but all are welcome. Driving Directions from Austin: From I-35 or Mopac go west on Hwy 71 past Bee Caves / turn right at light on Bee Creek Rd for 4.5 mi. / turn right on Siesta Shores Drive for 1mi. then left on Windy Shores Loop go 1 block to Bay Circle and the Marina will be on your left.